So, another week about to begin. I’m taking a break from my Braille practice to write to you. I was mightily confusing myself on Friday by constantly switching back and forth between the Perkins Brailler and my laptop (which I had directly behind the Brailler), and trying to touch-type both of them almost at once. I managed, fairly well, but both were somewhat slowed down. I think it helps that fewer fingers are used on the Brailler, as it helped my fingers decide which was which! The Indus Valley Civilisation flourished 4-6,000 years ago in an area around the border of modern-day India and Pakistan, but there is a lot that is unknown about it, and this presentation, aimed at children, is nice and clear for an uninformed adult as well. Books narrated by Death make me think of Terry Pratchett‘s Discworld character, but this book really isn’t so much like the few of Pratchett’s books I’ve read (the flatmate is more keen). Or perhaps it is, in some ways, but at the same time this has to be so much more serious, as set in the Germany of the 1940s in this world, and no other. I cried, but I did laugh, too, in some places, and I could accept the characters, in a setting more messed up for being real than any fiction. This is a very open and honest autobiography of a woman who is a prestigious enough artist in her own right to have received an MBE for services to art, and yet who is far better known as the subject of a controversial sculpture, and as a participant (with her son Parys) in the BBC‘s series Child of Our Time. This book is more about her life as a disabled woman than specifically as an artist, although since much of her art is to do with her body shape and people’s reaction to it, that is in no way ignored. I would heartily recommend this to those in art, disability, or just in biography in general. I’ve done some more on my granny square lap blanket, lesson 3 of the Braille Primer, and read another book at work. I could take and upload a picture of the first two, but it wouldn’t look particularly different from the latest photos you’ve seen already, so I’ll save on the memory. 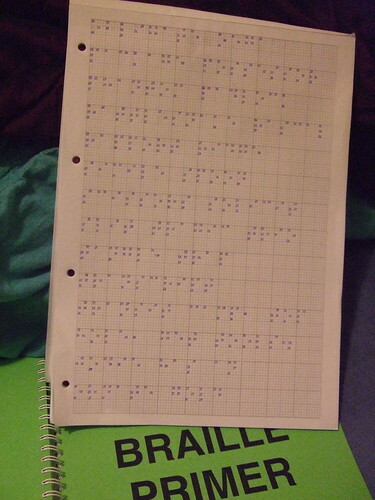 I’m feeling quite good about the braille letters now, although I can’t read words without working out each letter yet. I’ll get there. In tomorrow’s lesson I start on word contractions (abbreviations), so that’ll be more to remember. I did go and vote this evening, as I felt I must, considering all the struggles major and minor for emancipation (including a few relatively very small ones of my own for my right to vote this time), even though I literally hadn’t decided who I would vote for by the time I was at the booth with ballot papers and pen in hand. I amn’t going to tell you who I did vote for, and to be honest were I to do it again I amn’t sure it’d come out exactly the same, but that’s the way these things go. There’s been so much focus on the top two or three candidates for London Mayor that I’ve heard practically nothing at all about the candidates or parties standing for the London Assembly, and so the vote there had to be on party politics, which I don’t always think local elections automatically should be. But it’s done now, and all we can do is await the results. This book is similar to the one yesterday, with its introduction to the changing styles of fashionable dress during the covered period (here 1900-1910) for its subsection of the population. Whereas the plates in yesterday’s book were originally published in periodicals aimed directly at wealthier women, with children’s fashions shown alongside similar images of clothing for themselves, these plates appeared in supplements to the trade journal of gentlemen’s tailors, for the tailor to show his modish clients, rather than for the fashionable lady to show her dressmaker. While fashions for gentlemen changed just as often as those for ladies, these modifications were much more subtle, and indeed many of the items would be just about wearable today, given the right setting. Putting aside the golfing plus-fours and sailing outfits, the only strikingly different aspect of the suits and overcoats was the fact that several (although not all, by any means) had very defined waist shaping, which I don’t believe is seen in men’s clothing today. Nothing that would be unusual in tailoring for women, but eye-catching on men, to my not-particularly-fashion-aware modern eyes. I actually got to read, both in work and out of it, today, and I’ve also crocheted another ball or so of yarn on the Sea Swirls table cloth I resurrected from hibernation yesterday. I even went out for supper tonight, so a pretty good day. Another scrapbooking book, but this one is a nice introduction to the craft, with interesting examples and easy-to-personalise how-tos of some effective layouts. I still amn’t ready to buy the equipment needed to get started (a single hook, ball of string and How To Crochet leaflet aren’t that big of a financial investment for beginning a new hobby) but I do get vicarious pleasure from knowing what to appreciate in the crafts of others. I had fun at work today, ordering lots of books (that we do need). Another of those days that immediately shows either no results or further mess (because of focussing on things like ordering rather than clearing up), but it should bear fruit relatively quickly. And then this evening I’ve returned to one of my hibernating crochet projects and I’m hoping to finish it this week. We shall see. I amn’t entirely convinced I’ll ever get it to lay flat, though. So the second mitt is done, and I really like how it’s come out. Far better than the first, in fact, and now I’m thinking I want to redo the first! 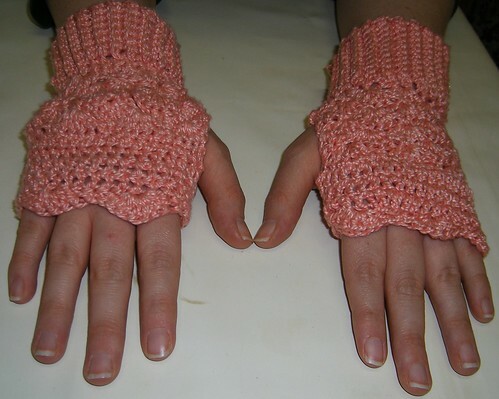 The person who took this picture for me says she likes how the fan pattern shows up more on the first (I did ‘too many’ stitches in each fan, so they puff out) but does agree it doesn’t fit half so well. So I think I’ll be crocheting on the bus again tomorrow morning! (I can’t bring myself to begin tonight – I want a bit of feeling good about ‘finishing’! I like this book rather better than the one on Cleopatra, as it seems a bit more about his exploits and rule than his love-life. I’ll admit that my knowledge of Alexander has largely come (a very long time – could it be eighteen or so years? – ago) from Mary Renault‘s The Persian Boy and its sequels. Let’s just say that those don’t paint his first wife Roxanne as the love of his life, the way this one hints (but not very strongly) at.